As expected, it was attention grabbing in the common parking lot. Colleagues came down to see and hear it live. Some unknown employees too went down and had a look. Got glances and questions everywhere :) The size and color is more attention grabbing that exhaust. On return trip, it started drizzling and lightening due to receding monsoon (was I being photographed from above? :D ). Managed to reach home before it rained but bike had to face rains afterwards in parking. Will have to wipe it off before sleeping and put the covers on. Loved the first day out!!! They always said that life changes in India after you bring home a superbike. 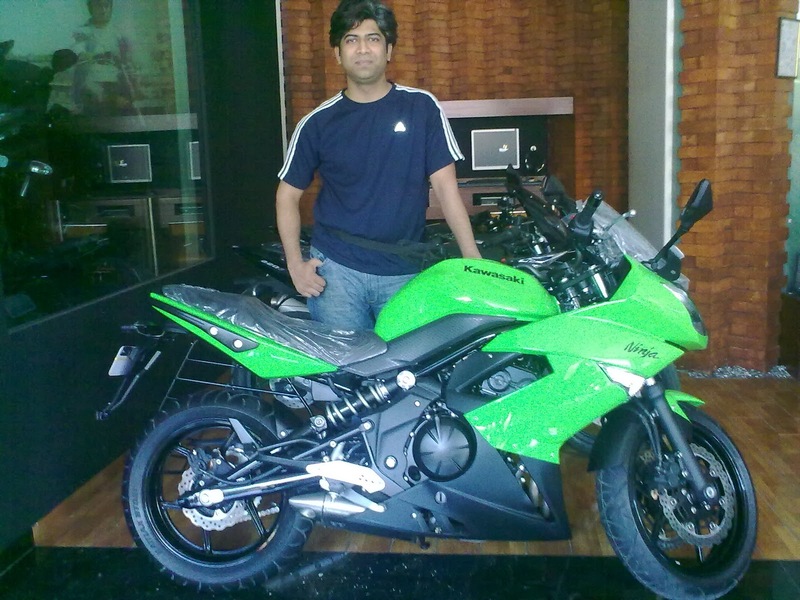 Ninja 650R is not really a superbike but by Indian standards of commuter biking, it definitely is one. 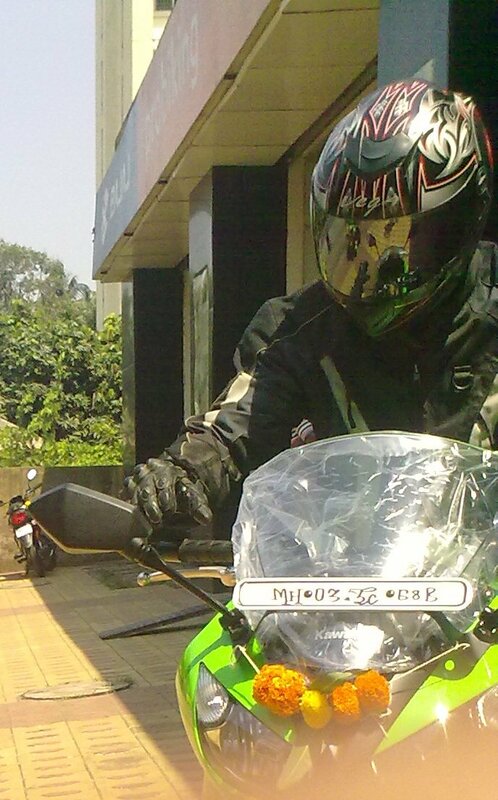 Its been just two days that the bike has come home. Registration formalities are underway and I am already feeling the "Living with Ninja Experiences". People started approaching right at the showroom door and started asking price. Dad was zapped after knowing it. He couldnt believe that it costs that much. and then "You could buy a big car in that money!". The sweeper in the next building came running and insisted that I tell him the price. One shop owner offerred me to park it inside his compound instead of parking on the road, without asking. Never happened in past when I parked P180 or P220F in front of this shop. One guy on road, honked and gave thumbs up, then proceeded to tail for a while. One fellow asked if he can sit and take a pic (I really appreciate these manners, as long as I can politely say No :) ). He took a pic and told me, "It would go on facebook now and your bike will be famous"
She arrived and preturbed my miniscule world. I was simply love at first sight. Her voice was not the sweetest yet it was seductive enough. Touching her was romantic. Cupid arrow hit the vantage point and paralysed rational thinking system. I looked in her eyes in anticipation. "I am no rich, I am no superhero, You will get small place to stay, but endless road to travel with me. Will you still be mine? ", I asked with anxity. She was responsive and ready to come along. The family was orthodox. I had to arrange dowry. "Nagad do, Dulhan le jao", her caretaker said withough blinking an eye. The demand meant a fortune and years spent inside four walls of professional jail to earn it. Friends were critical. "She is an expensive women and you are not meant to have one. ", I was told and joked around. She was not the only one around but she seemed perfect. "Would I want to give up a fortune to be with her, pamper her and take her places? ", I asked myself. "YES", this echoed somewhere deep within. Submission was destined. The wait was long. I had time to prepare. I had to buy her stuff before she arrived. I wanted to look the best on "the day". The nights were long and days were dreamy. She was with me virtually every minute and on every road. The feeling of wondering didnt seem to end. There is always something in life that you crave for all along. It was this at moment and it seemed like a mirage. Finally the day arrived. I reached the venue, eyes rolled in every corner for a view of her. Feet were shaky and palms had become damp. The priest stood in front and finally she arrived. My eyes didnt blink for next few minutes. She seemed eager too, anxious and nervous, I was more. Time was running slow and heart beat faster than an crazy engine on track. Priests announced, "Who gives this woman to be married to this man? ", her caretaker came forward, "I do". I heard further, "Let me charge you both to remember, that your future happiness is to be found in mutual acceleration, idling, revving, honking, touring, commuting and affection. It is your duty to love her as yourself, provide tender leadership, and protect her from danger. ", "It is your duty to treat him with respect, take him places and father happy triplogs. ", "It is the duty of each of you to find the greatest joy in the company of the other; to remember that in both interest and affection, you are to be one and undivided. You will be rider because of her and you will ride because of him." "Do you accept each other as your partner to hold and have hold from this day forward, for better or worse, to love and cherish, till 'death do us apart?'" "YES I DO! ", I couldnt say anything else. I can now kiss the bride!!!!! !